Arriving by public transportation andexploring the city centre by bicycle or e-bike – this is the visionthat PubliBike is putting into action in Switzerland. In a firststep, railway stations will be equipped with bicycles and e-bikes. This service is offered by project partners PostBus, SwissRailways SBB and Rent a Bike to support urban sustainablemobility. ROUTE PLANNER & MOBILE TICKETING The PostBus app combines thepublic transport timetable with the sharing services of PubliBike,Mobility, Catch a Car, Sharoo, ParkU, go! Taxi and Flinc. 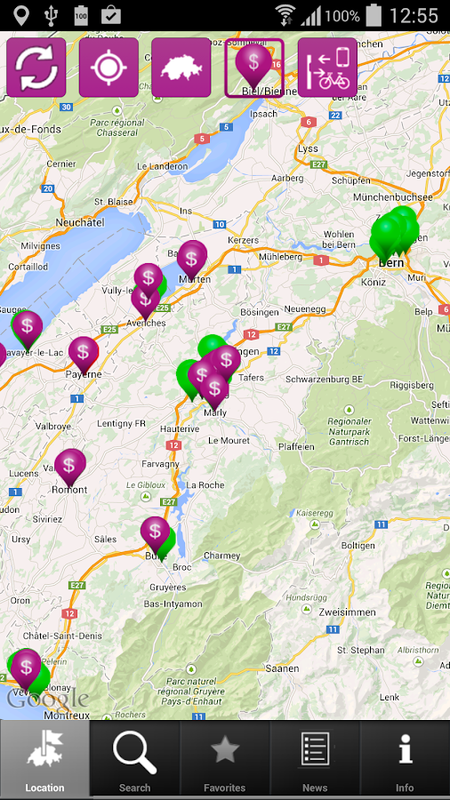 Inaddition, it is also possible to use the app to buy tickets for allpublic transport throughout Switzerland. PUBLIC TRANSPORT COUNTDOWNFUNCTION The starting time from your location to your personallydefined stops appears directly on the start screen without anyfurther necessity to click here and there. Simply add yourfavourites and you will always know exactly when you have to leave.FEATURES - Individual travel plans throughout Switzerland usingvarious methods of transport - Find various mobility optionsdirectly on the map display - Quick selection of a public transportticket within fare/transport networks - Purchase of day passes orsaver day passes directly under “Tickets” - Current notificationsregarding interruptions and detours. -Use the “alarm” button toobtain push notifications regarding interruptions or delays on theplanned public transport route - Frequently used locations can besaved as favourites. - Define your route options according to yourpersonal preferences directly in the route search - List yourconnections according to “next”, “fastest” and “least expensive”The advantages: - Individual route planning according to yourpreferences. - Compare all methods of transport with the variouspossible combinations directly in the app. - One app for allnational public transport tickets. And the assortment of tickets isconstantly being added to. Further Information atwww.postbus.ch/tickets The use of GPS in the background can shortenthe battery operating time. Arriving by public transportation andexploring the city centre by bicycle or e-bike – this is the visionthat PubliBike is putting into action in Switzerland. In a firststep, railway stations will be equipped with bicycles and e-bikes.This service is offered by project partners PostBus, SwissRailways SBB and Rent a Bike to support urban sustainablemobility. VS Mobility liefert Echtzeitinformationen zumÖV im Grossraum Wallis.Die Informationen beinhalten:- Die nächsten Abfahrten ab einer bestimmten Haltestelle- Standort und Distanz zu den nächsten Haltestellen(LocateMe)- Den Echtzeit-Fahrtverlauf von Bus- Störungsmeldungen und Umleitungen- Integration von Maps, zur Darstellung derHaltestellen-Standorte- Auswahl und Suche nach Haltestelle oder aktuellem Standort- Häufig verwendete Haltestellen können als Favoriten hinterlegtwerdenWo vorhanden, werden die Zeiten direkt aus demVerkehrsleitsystemen angezeigt. Falls es also zu Verspätungen kommtoder eine Linie ausfällt, werden Sie darüber aktuellinformiert.Wo vorhanden, werden die Zeiten direkt aus dem Verkehrsleitsystemenangezeigt. Falls es also zu Verspätungen kommt oder eine Linieausfällt, werden Sie darüber aktuell informiert.VS Mobility providesreal-time information on public transport in the greater Wallis.The information includes:- The next departures from a specific stop- Location and distance to the next stops (LocateMe)- The real-time driving history of bus- Failure reports and diversions- Integration of maps showing the stops locations- Selection and search for stop or current location- Stops frequently used can be saved as favoritesWhere available, the times will be displayed directly from thetraffic control systems. So if it comes to delays or a line fails,you will be informed to date.Where available, the times will be displayed directly from thetraffic control systems. So if it comes to delays or a line fails,you will be informed to date. Im Postauto ist was los. Da steigen Leute ein und aus, essen,trinken, hören Musik und lesen Zeitung. Unterschiedlicher könntendie Bedürfnisse nicht sein. In einem sind sich aber alle einig. Siewollen pünktlich und sicher ans Ziel kommen. Hast du das Zeug, allebei Laune zu halten und so zu verhindern, dass andere Fahrgästeoder das ganze PostAuto unter dem Frust einzelner leiden?Willkommen bei "SensiGame". Auf einer Reise durch die Schweizerlebst du unterschiedlichste Fahrgäste und Situationen. Stelledein Wissen unter Beweis und erspiele dir Kampagnen. Diese helfendir für Recht und Ordnung im PostAuto zu sorgen. PostAuto SchweizAG präsentiert ein spannendes und edukatives Spiel über dasVerhalten in öffentlichen Verkehrsmitteln für grosse und kleinePostautofahrer/innen. Spielerisch vermittelt "SensiGame" diegewünschten Verhaltensweisen im öffentlichen Verkehr. Viel Spass!InPostbus what's going on. As people climb in and out, eat, drink,listen to music and reading newspaper. Different needs could notbe. In a but they all agree. You want to come on time and safely.Do you have what it takes to keep everyone happy and to prevent sothat other passengers or the whole Postbus individual sufferingunder the frustration? Welcome to "Sensi Game".On a trip throughSwitzerland you will experience a wide variety of passengers andsituations. Test your knowledge to the test and you play forcampaigns. This will help you to maintain law and order in the mailcar.Post Auto Switzerland AG presents an exciting and educativegame about the behavior on public transport for large and smallpost driver / inside. Playfully "Sensi Game" the desired behaviorsin public transport. Have fun! Une appli de ticketing sur la base delaprocédure Check-In Be-Out (CIBO) pour un essai pilote dans lecadredu MobilityLab (porté par La Poste, CarPostal, EPFLausanne,HES-SO,Canton du Valais, Ville de Sion). L'application seconnecteautomatiquement au router WLAN dans le véhicule deCarPostal. Audébut de son parcours le passager pousse le buttonCheck-In. Lecalcul de son itinéraire et en particulier la detectionde sasortie se font automatiquement et immédiatement lorsquelaconnexion avec le router se coupe.A ticketing app basedonthe Check-In process Be-Out (CIBO) for pilot testing intheMobilityLab (borne by La Poste, Bus, EPFLausanne, HES-SOValaisCanton, City of Zion) . The application automaticallyconnects tothe WLAN router in the vehicle Bus. Early in his careerthepassenger pushes the button Check-In. Calculating itsroute,particularly the detection of its release are automaticallyandimmediately when the connection with the router cuts. Reisebegleiter Waldstätterweg. DerReisebegleiter, der sich selber meldet: App zum thematischen Inhaltdes Waldstätterweges, der Tourismus- und Agrargeschichte derVierwaldstätterseeregion. An 50 Standorten werden dazu mit Texten,Abbildungen und historischen Film- und Tondokumenten Informationenvermittelt.Unerlässlich: download des App über eine WLAN-Verbindung und eingeladener Akku vor jedem Etappenstart. Die Inhalte des Apps sindauch auf dem Web aufgeschaltet (www.waldstaetterweg.ch).Die fortgesetzte Nutzung vom GPS im Hintergrund kann dieLebensdauer der Batterie drastisch verringern.Travel companionWaldstätterweg. The traveling companion who reports himself: Appfor thematic content of Waldstätterweges, the tourism andagricultural history of Lake Lucerne. Information will be at 50locations with text, images and historical film and soundrecordings gives.Indispensable: download the app via a wireless connection and acharged battery before each stage start. The content of the appsare also on the web switched (www.waldstaetterweg.ch).Continued use of GPS running in the background can reduce thebattery life dramatically. «NordwestMobil» ist Ihr Routenplaner für dieNordwestschweiz und berücksichtigt dabei nicht nur den öffentlichenVerkehr, sondern auch Car-Sharing, Mitfahrgelegenheiten,Bike-Sharing, Taxi-Dienste, das eigene Auto, das eigene Velo sowieFusswege. Die App hilft Ihnen auch bei der Parkplatzsuche und zeigtIhnen freie Plätze in den grössten Basler Parkhäusern sowiemietbare Privatparkplätze an. In der Kartenansicht finden Siespannende Freizeitaktivitäten in Ihrer Nähe. Erleben Sie schonheute die multimodale Mobilität von morgen.Die Vorteile im Überblick:• Reisen mit System: Lassen Sie sich verschiedene Möglichkeitenanzeigen, um von A nach B zu gelangen, und kombinieren Sie dabei jenach Ihren Bedürfnissen mehrere Verkehrsmittel miteinander.• Freie Parkplätze: «NordwestMobil» zeigt Ihnen freie Parkplätze inden grössten Basler Parkhäusern sowie mietbare Privatparkplätzean.• Events in der Nähe: Möchten Sie wissen, wo etwas läuft und wieSie am einfachsten dorthin gelangen? Dank «NordwestMobil» findenSie zahlreiche Events in der Region samt Routenplanung.«NordwestMobil» ist ein Innovationsprojekt von PostAuto und wird inKooperation mit dem TCS und den Basler Verkehrs-Betrieben BVBdurchgeführt. "Northwest Mobile" isyour route planner for the Northwestern Switzerland, taking intoaccount not only public transport but also car sharing, carpool,bike sharing, taxi services, your own car, your own bike andwalking paths. The app also helps you find a parking spot and showsavailability in the largest Baslerpark houses and rentable privateparking at. In the map you will find exciting activities in yourarea. Experience today the multimodal mobility of tomorrow.The benefits include:• Travel with a system: Let display different ways to get from A toB, and combine it depending on your needs more modes of transporttogether.• Free parking: "Northwest Mobile" shows you free parking in thelargest Baslerpark houses and rentable private parking.• Events nearby: Do you want to know where things go and how to getthe easiest way to get there? Thanks to "Northwest Mobile" you willfind many activities in the region, including route planning. "Northwest Mobile" is an innovative project of post bus and isperformed in cooperation with the TCS and the Basel trafficoperations BVB. Travel through the day more easily with SBB Mobile. The app offerssimple and personalised timetable enquiries – and you can purchasea ticket in just two clicks. An integrated travel companion keepsyou up to date on delays, platform changes and train cancellationsin real time. You can now purchase your tickets by «monthlyinvoice» – Switzerland’s favourite way to pay online. And did youknow that you can buy cheap tickets like the Saver Day Pass andsupersaver tickets on the app? Timetable features: •Touch-Timetable • Connections from current location • Local,national and international timetable queries • Connectioninformation with real-time data • Occupation forecast •Take-Me-Home functionality Assortment: The current version of SBBMobile allows you to purchase the following types of tickets: •Regular tickets in Switzerland • Tickets for regional fare networks• Supersaver tickets • City-City-Tickets • Day passes • 9 o'clocktravelpass • Class upgrades (Switzerland) • Class upgrades(regional fare networks) • Nighttime supplements • Bike passes •Travelpass for children • Travelpasses for dogs • Seat reservations• Bike reservations • Class upgrade from 9 a.m. • Special regionalfare tickets The available features of SBB Mobile are constantlybeing expanded. However, the following features are not yetavailable: • Extension tickets • International tickets • Swisstravelcards Payment options include credit cards or thePostFinance-Card. Data security and authorisations. Why does SBBMobile require authorisations? Location: To use the "take me home"function and display the stops in the vicinity of the currentlocation, the GPS function must be active. Calendar and e-mail: Toimport timetable information into the calendar, SBB Mobile requireswriting and reading rights. Camera hardware control elements. To beable to personalize your touch-timetable. Internet access: Totransmit timetable and ticket request enquiries. Storage: For theoffline functions such as lists of stops, connections (history andfavourites) and purchasing tickets. Deactivate standby mode:Prevents the smartphone screen being turned off and the devicebeing put on standby before you have received a push notification.Control vibration alarm: So that the device can vibrate when a pushnotification comes in. Note: SBB Preview is a preview version of the SBB Mobile app. Hereyou will get a chance to pre-test all the new features. There canbe bugs on this preview version, but we will try our best to solvethem as soon as possible. If you are not interested on this, thenplease use the “official” app SBB Mobile. Find more Informations onthe preview program under www.sbb.ch/en/preview Travel through theday more easily with SBB Preview. The app offers simple andpersonalised timetable enquiries – and you can purchase a ticket injust two clicks. An integrated travel companion keeps you up todate on delays, platform changes and train cancellations in realtime. You can now purchase your tickets by «monthly invoice» –Switzerland’s favourite way to pay online. And did you know thatyou can buy cheap tickets like the Saver Day Pass and supersavertickets on the app? Timetable features: • Touch-Timetable •Connections from current location • Local, national andinternational timetable queries • Connection information withreal-time data • Occupation forecast • Take-Me-Home functionality •Departure Board Assortment: • Regular tickets in Switzerland •Tickets for regional fare networks • Supersaver tickets •City-City-Tickets • Day passes • 9 o'clock travelpass • Classupgrades (Switzerland) • Class upgrades (regional fare networks) •Nighttime supplements • Bike passes • Travelpass for children •Travelpasses for dogs • Seat reservations • Bike reservations •Class upgrade from 9 a.m. • Special regional fare tickets Theavailable features of SBB Mobile Preview are constantly beingexpanded. However, the following features are not yet available: •Extension tickets • International tickets • Swiss travel cardsPayment options include credit cards or the PostFinance-Card. Datasecurity and authorizations. Why does SBB Mobile Preview requireauthorizations? Location. To use the "take me home" function anddisplay the stops in the vicinity of the current location, the GPSfunction must be active. Camera hardware control elements. To beable to personalize your touch-timetable. Internet access: Totransmit timetable and ticket request enquiries. Storage: For theoffline functions such as lists of stops, connections (history andfavourites) and purchasing tickets. Deactivate standby mode:Prevents the smartphone screen being turned off and the devicebeing put on standby before you have received a push notification.Control vibration alarm: So that the device can vibrate when a pushnotification comes in. SBB Mobile Business simplifies your business trip management:thisbooking tool for all your company's employees gives you atransparent overview of costs. SBB Mobile Business is perfectlytailored to business travellers' needs: You can call up publictransport timetables in real time. Once you have registered atwww.sbb.ch/en/business you can buy and display tickets on yoursmartphone anywhere and any time. Your purchases will be directlydebited to the cost centre you have saved, thus simplifying expensemanagement for you. For further information, seewww.sbb.ch/en/mobilebusiness. Timetable functions• national,international and town service timetable enquiries• search by:station, stop and (contact) addresses with GPS support• pushmessages: delays, platform changes, seat occupancy indicator, etc.•"take me home" function• departures/arrivals tables• intermediatestops and realtime travel information • map views of startingpoints and destinations• import timetable queries into yourcalendar and e-mail them • rapid access via FavoritesTicketfunctions: • buy and display public transport tickets forSwitzerland for up to eight passengers.• the offering includesindividual tickets, regional travel system tickets, one-daytravelpasses, class upgrades, seat reservations for Switzerland.•payment is via a company contract with SBB Businesstravel. All youneed to do is register once with SBB Ticket Shop Business atwww.sbb.ch/en/business and save a means of payment at "My account"– "Payment information".• expense invoices can be called uponline.• most sales are eligible for discounts.Please note: privatecustomers of SBB can use the SBB Mobile app. Data security andauthorisationsWhy does SBB Mobile Business ask for authorisations?Location:To use the take-me-home function and display thestations/stops near your current location, your GPS function mustbe activated.Internet access:For transmitting timetable and ticketenquiries.Contact details:So that you can import other passengersfrom your address book when you buy a ticket, or to select contactaddresses as your destination when running timetable searches.Calendar and mail: To import timetable outputs into your calendar,SBB Mobile Business needs read and write authorisation. Memory:Foroffline functions such as the list of stations/stops, connections(current location and favorites) and ticket purchases.Deactivatestandby mode:Prevents the smartphone screen from switching off orthe phone from going into standby mode before you have received apush message.Control vibrate alarmSo that the device can vibratewhen a push message arrives.Android camera hardware controlelements For using the integrated QR reader. Mit der SBB P+Rail-App finden Sie ganz einfach die nächstgelegeneP+Rail-Anlagen und bezahlen den Parktarif bequem über dasSmartphone - gleich vor Ort nach dem Parkieren oder bis zu 7 Tageim Voraus. Alle mobil buchbaren P+Rail-Anlagen können Sie sich nachBelieben auf dem angezeigten Karteausschnitt oder als Listeangezeigt lassen. Zu jeder P+Rail-Anlage gibt esDetailinformationen wie Adresse oder Parktarif. Die Bezahlungerfolgt bargeldlos via hinterlegter Kreditkarte. Der Routenplanerleitet Sie von Ihrem aktuellen Standort direkt zur Einfahrt derP+Rail-Anlage.Die Parkzeit lässt sich bei Bedarf von unterwegs viaSmartphone verlängern. In Ihrem Benutzerprofil werden alle IhreBuchungen gespeichert. Sie können auf Ihren Buchungsnachweisjederzeit, beispielsweise für eine Spesenabrechnung zugreifen.Zudem können sie im Benutzerprofil Ihre persönlichen Angaben oderdie Auto-Nummer verwalten.With the SBB P + Rail app you can easilyfind the nearest P + Rail systems and pay the parking feecomfortably on the smartphone - the spot to park after or up to 7days in advance.All mobile bookable P + Rail systems you can bedisplayed at will on the displayed map neckline or as a list. Itprovides detailed information such as address or parking tariff atany P +-rail system. Payment is via cash-backed credit card. Thedirections will guide you from your current location directly tothe entrance of the P +-rail system.The Park Time can be extendedvia smartphone when needed while traveling.All bookings will bestored in your user profile. You can access your Proof of bookingat any time, for example, for an expense report. In addition, theycan in the user profile manage your personal details or the carnumber. ENTERTRAINMENT – DIE GLEIS7-APP: Nie mehr gelangweiltunterwegs.Solltest Du bei der Verwendung unserer App Problemefeststellen, bitten wir Dich, das Feedbackformular aufgleis7.ch/kontakt/ zu nutzen oder eine E-Mail an die [email protected] zu senden. Leider haben wir keine Möglichkeit aufDeine Bemerkungen im App Store (Rezensionen) zu antworten.Wiefunktioniert gleis7 Entertrainment?Immer bevor du in einen Zugsteigst, checkst du mit deiner App ein. Am Zielbahnhof angekommen,checkst du dich wieder aus. Die gefahrenen Kilometer werdenautomatisch in gleis7-Credits umgewandelt und deinem Kontogutgeschrieben. Mit den gleis7-Credits stehen dir exklusiveVorteile zur Verfügung. So profitierst du unter anderem vonKinogutscheinen oder Rabatten auf Kleider und Videogames.Die Appsagt dir, wer sonst gerade im Zug eingecheckt hat. So kannst duneue Leute kennenlernen, mit ihnen chatten, flirten oder gegen sie4gewinnt spielen. Und für dich allein sammelst du heisse Trophäen.Wichtig: Damit wir die zurückgelegten Kilometer deinem Konto alsCredits gutschreiben können, musst du dein Abo auf gleis7.chregistrieren. Für die Benützung der App brauchst du ein gültigesSBB Abo und musst zwischen 13 und 25 Jahre alt sein.Wird die„Check-in“ Funktionalität verwendet, wird das GPS im Hintergrundaktiviert bleiben. Bitte beachte dass dadurch dieBatterielebensdauer drastisch verringert werden kann.ENTER TRAINMENT - THE GLEIS7 App: No more bored go.If you encounter problemswhen using our app, we ask that you / use the feedback form togleis7.ch/kontakt or send an e-mail to the address [email protected], we have no way to your remarks at the App Store(reviews) to respond.How does gleis7 EnterTrainment?Always beforeyou get on a train, you check one of your app. Arrived at thedestination station, you check you out again. The kilometers areautomatically converted into gleis7 credits and credited to youraccount. With the gleis7 credit you are exclusive advantagesavailable. So you benefit from including cinema vouchers ordiscounts on clothes and video games.The app tells you who else hasjust checked the train. So you can learn, chat, flirt or playagainst them 4gewinnt with them new people. And to yourself youcollect trophies hot.Important: In order to the kilometers creditedto your account as a credit, you must register on gleis7.ch yoursubscription. For the use of the app you need a valid subscriptionSBB and have between 13 and 25 years of his.If the "check-in"functionality used, the GPS will remain active in the background.Please note that this battery life can be drastically reduced.